It’s very fortunate that the people who live at 1196 W. Gold Street in Kuna are OK after a 14-year-old boy drove a stolen car into the front of their house early Wednesday morning. The boy is being treated at a local hospital for what appear to be minor injuries. 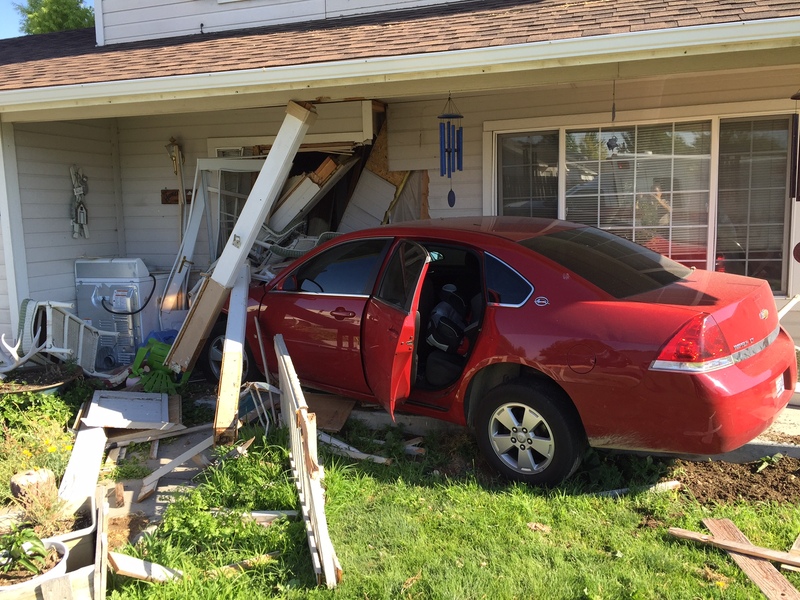 Kuna police were called to the Gold Street home just after 9 a.m. when they got a 911 call from a resident reporting that a car just smashed into the front of their house. The caller said they couldn’t open the front door to see if anyone in the car was injured. Dispatchers got another 911 call moments later from a house on nearby Marteeson Avenue, where a woman said she saw a teenage boy wandering outside who had some injuries, so she brought him inside. Officers were able to quickly put together what happened. The boy, who is developmentally disabled, took his family’s car without permission and drove about six miles across town before he lost control and drove into the home on Gold Street. When the boy couldn’t back the damaged car out of the wreckage, he got out and ran away. The boy was barefoot, so he had some minor injuries to his feet when the woman on Marteeson Avenue saw him and asked him to come in so she could help him. Paramedics took the boy to a local hospital as a precaution. No one in the house on Gold Street was in the front of the house when the car smashed into it so they were able to avoid injury. Officers are not sure why the boy was driving by Gold Street or what happened to cause him to lose control of the car.